Solid geometry is concerned with three-dimensional shapes. how to calculate the volume of a cone. how to solve word problems about cones. how to prove the formula of the volume of a cone. 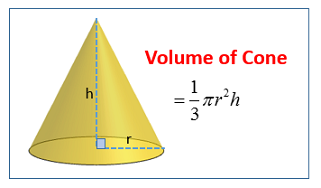 The following diagram shows the formula for the volume of a cone. Scroll down the page for more examples and solutions on how to use the formula. A right cone is a cone in which the vertex is vertically above the center of the base. When the vertex of a cone is not vertically above the center of the base, it is called an oblique cone. The following diagrams show a right cone and an oblique cone. In common usage, cones are assumed to be right and circular. Its vertex is vertically above the center of the base and the base is a circle. However, in general, it could be oblique and its base can be any shape. This means that, technically, a pyramid is also a cone. where r is the radius of the base and h is the perpendicular height of the cone. Worksheet to calculate the volume of cones. Calculate the volume of a cone if the height is 12 cm and the radius is 7 cm. How to use the formula to find the volume of a cone? It provides an example of how to determine the volume of a cone. 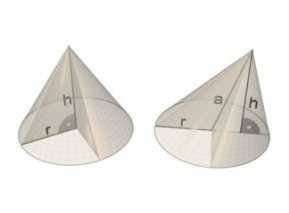 How to solve Word Problems about Cones? A Maxicool consists consists of a cone full of ice-cream with a hemisphere of ice-cream on top. The radius of a hemisphere is 3 cm. The height of the cone is 10 cm. Calculate the total volume of the ice-cream. A scoop of strawberry of radius 5 cm is placed in a cone. When the ice-cream melts, it fills two thirds of the cone. Find the volume of the cone. (Assuming no ice-cream drips outside the cone). This video will demonstrate that the volume of a cone is on-third that of a cylinder with the same base and height. This is not a formal proof. You would need to use calculus for a more rigorous proof. How to derive the formula for the volume of a right circular cone using calculus? Derive the formula for the volume of a right circular cone using the method of washers (disks). We use integration to deduce the formula for the volume of a cone.